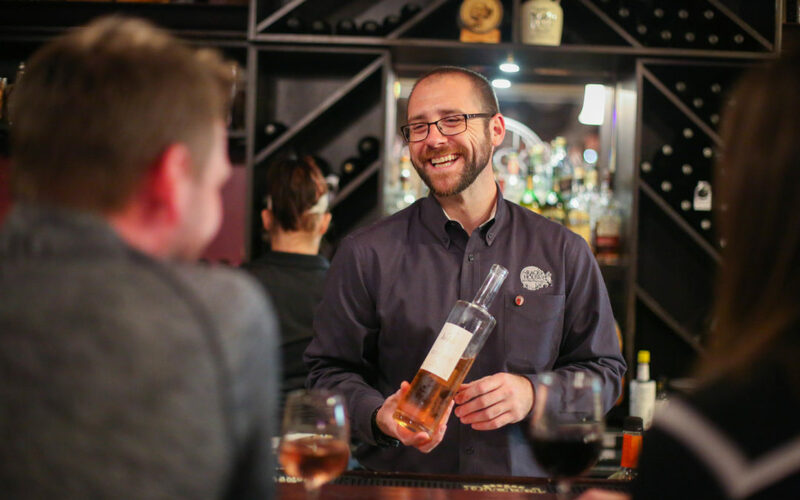 Wine Club Members, below is information by Sommelier Josh French regarding the Sept. 2018 bottles available for pick up. As always, we appreciate you support and loyalty! District 7 Pinot Noir is a newer addition to our wines by the glass offerings. This wine comes from the Scheid Vineyards. Some of you are very familiar with Odd Lot, the blend we have had go through wine club a couple of times and its big brother VDR. If neither of these rings a bell, make sure to ask about them the next time you are in. Of all grape varieties, Pinot Noir is one of the most sensitive to its terroir. At Scheid they work hard each vintage to get it right in the vineyard so that when the grapes are harvested and arrive at the winery, they can step aside and allow the fruit to speak for itself. The cool temperatures of District 7 present ideal growing conditions for Pinot Noir. Despite a lighter crop from one of the earliest harvest seasons on record and a fourth year of drought, quality was high across the board in the Monterey area. The wine is aged in a combination of new and neutral oak, to craft a lush, elegant wine with bright fruit aromas and vivid flavors. Aromas of cherries, raspberries, pomegranates with hints of vanilla and mocha. This wine is medium bodied with soft tannins, bright red fruit with a lingering subtle sweet oak note. An elegant, balanced offering that is the ultimate food wine. Try it with grilled salmon, roast duck, pork tenderloin or soft-ripened cheeses. 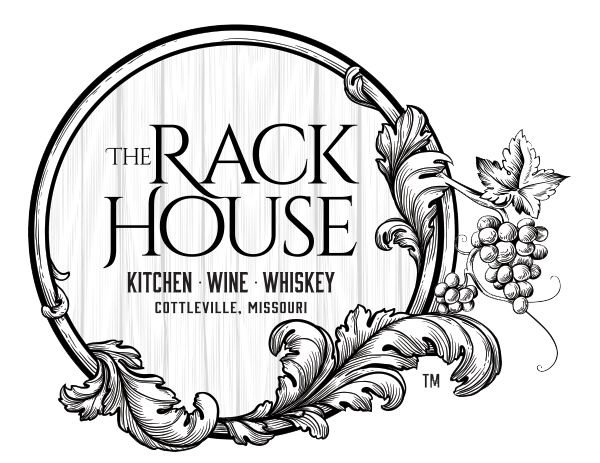 Most of which you can find on the new Rack House Kitchen Wine Whiskey menu. Milton Park Shiraz is our second Red selection. This wine was harvested in March of 2015 in South Australia and bottled a year later. The 2015 Vintage was characterized by a dry period extending from July to April, together with warmer than usual temperatures during Spring until mid-January which advanced maturity on lower yielding vines. Mild temperatures from Mid-January slowed maturities concentrating flavor and intensifying color development. The grapes are crushed and de-stemmed into fermenters. Yeast is added immediately once in fermenting and the ferments are pumped over twice daily to maximize color, tannin, and flavor extraction. Cooling is used to ensure ferment temperatures remain just below 75 degrees Fahrenheit, which will allow the fruit to display maximum fruit expression. Pressing then occurs approximately seven days after crushing and the wine is then put into predominately American oak to mature. The nose is lifted berry fruits, with hints of dark chocolate and spice. The palate is medium bodied with intense plummy fruit. This plummy fruit fills the whole palate and combined with the soft and approachable tannin creates a very mouth filling wine. The length of flavor is long with plumy and licorice fruit and spicy oak. The first wine in the white category this quarter is something fun to say good bye to summer with. This is a wine that is not your typical wine. Sandara Mojito Wine is a blend of 40% Viura, 30% Sauvignon Blanc, and 30% Verdejo. 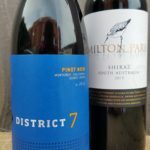 In this quarters selection you are going to find the Wine Club Exclusive selection, but first I want to talk about the red option in Josh’s Selection. 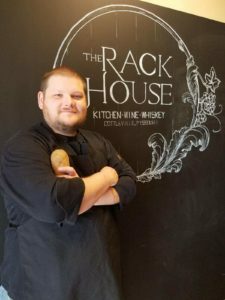 This is a newer wine to the bottle list at The Rack House Kitchen Wine Whiskey, but on that has not only me but Chef, excited about great wine in a fun package and something we want to take home and share with our friends and family. This first wine comes from the producer Bodegas in the region of Calatayud, Spain and is 100% Garnacha and is named Honora Vera. The Honora Vera sees only 2 months of aging in French oak barrels. This is after it sees it’s first 15 days in small stainless-steel tanks at temperatures below 80 degrees. The vineyard sits between 2,300 to just under 3,00 feet above sea level. The grapes are being harvested from vineyards that are 30-40 years old. The vineyards are planted in mainly decomposed slate and gravely clay soils. It exhibits greater aromatic complexity, richness with mineral and blueberry notes leading to a savory and spicy wine nicely balanced and very easy to drink. This wine fits into our mix with food very easily with flavors that could be matched with everything from goat cheese, cured meat, grilled vegetables, red sauce pastas, mushrooms, to almost any roasted or grilled meat including but not limited to chicken, beef, and lamb. Grilled fish could also see a benefit with this wine. Now, on to the Exclusive wine. If you have noticed a trend with our exclusive wines, it could easily be said that I have picked these to possibly stretch our members out of a comfort zone, while providing a great value and opportunity to try things you may not normally gravitate towards. Another reason I pick wines for the club are to get feedback and try things that are a little more seasonal (See Sandara above). 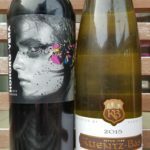 If there is enough interest and good feedback, these wines will stay around a little longer and be offered to the public. Remember, these exclusive wines are for Wine Club members only. Pick it up for your quarterly selection, purchase a bottle to take with you or dine in with it. 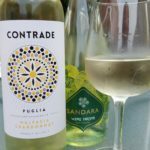 The name Contrade (Latin for parcel of land) refers to vineyards bordered by olive trees, stone walls or other natural features that become identifiable by their name. The Contrade label design is a restyled graphic of the rose window of one of the most popular baroque churches of Lecce, Basilica di Santa Croce. While this is a blend, the label states this wine as Malvasia/Chardonnay. This white wine is a blend of Malvasia Bianca (90%) and Chardonnay (10%). The Malvasia grape may be the “stepping out of your comfort zone” grape is this mix but please do not let the unknown scare you away from this amazing wine. Malvasia is an ancient indigenous grape of the whole Mediterranean area. The name “Malvasia” derive from Monemvasia, a medieval and early Renaissance Byzantine fortress and trading center for wine produced in that area. Crispy, aromatic and floral, blended with Chardonnay which comes very fresh, mineral and tasty. The grapes come from the Puglia appellation with the vineyards located in Cellino San Marco. Harvest time for these grapes came in the mid of August and are hand-picked and collected in small cases. In making the wine once it’s in from the fields consists of de-stemming of the grapes and maceration for a few hours, followed by a soft pressing. All processes in the cellar done in the mid 50 degrees Fahrenheit to preserve flavor and crispness. Finally, comes the ageing. This is done in stainless steel tanks. This wine looks straw yellow in color with lemon green shades. This wine reminds me of lime, kiwis, apple and flowers. This is a great crisp, clean, and easy to drink wine. Perfect to finish summer with.